Reduction in leaf development has certainly been a remarkable feature of cactus evolution. 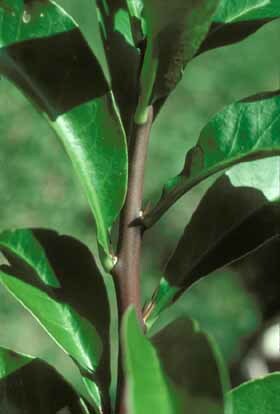 Plants in the cactus genus Pereskia still have large, thin leaves with a well-developed lamina and short petiole, so modification of leaf morphogenesis genes did not become extensive until after the rest of the cacti had diverged from the pereskias. Plants in subfamily Opuntioideae all have leaves large enough to be easily visible. In the opuntioid genera Pereskiopsis and Quiabentia, leaves are small but do have a flat lamina with reticulate venation. Leaves in all other opuntioid genera lack a lamina and are instead cylindrical. Those of Austrocylindropuntia are several centimeters long and can remain green and healthy for at least a full year or two, but in most other opuntioids they are smaller and more ephemeral. As might be expected, leaves of Pereskia and the opuntioids have numerous features that would be expected of ordinary leaves, in particular an upper and lower epidermis, chlorophyllous mesophyll, primary xylem and phloem. 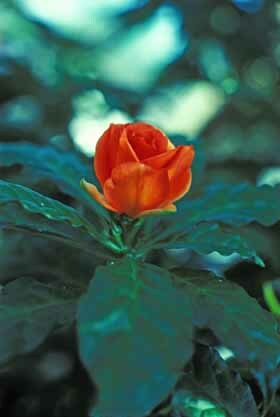 Pereskia bleo -- all pereskias have large, thin leaves. Click on any photo for a larger image. Plants of Pereskia grandifolia have very large leaves. 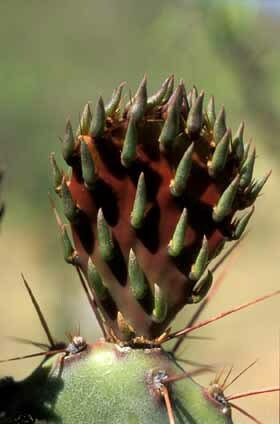 Notice that spines can be seen emerging from the axillary buds. Leaf veins in a cleared leaf of Pereskia sacharosa. Large leaves not only allow greater photosynthesis and water loss, their veins provide the mechanism for unloading water from xylem vessels. The evolutionary loss of leaves also resulted in the loss of leaf venation. The large subfamily Cactoideae contains many types of cacti that all appear to be leafless. However, a close examination – even with the naked eye in some – will reveal a tiny residual leaf just below each spine cluster (the spine clusters are axillary buds). By examining shoot apical meristems by light microscopy, it can be seen that all Cactoideae produce leaf primordia, all of which develop at least a little. Studies of cactus leaves are still in progress, but it seems that all leaves in Cactoideae become at least one hundred micrometers long and all seem to have xylem and phloem, and many have stomata on their lower epidermis. It is a bit surprising that such tiny leaves activate so many leaf morphogenesis genes, but at this point, it seems that evolutionary modification of cactus leaf morphogenesis affected mostly leaf size and shape and had only a minor affect on leaf complexity. More details will be posted as they become available. Leaves on a young pad (cladode, flattened shoot) of Opuntia phaeacantha var. violacea. These leaves are ephemeral and will fall off after just a few weeks -- long before they experience summer drought. Leaves are just barely visible on Matucana aureiflora. Click on any photo for a larger image. Leaves on Rhipsalis lumbricoides are tiny scales that apparently desiccate and die quickly. Reduction in cactus leaves had several consequences other than just a reduction in the surface area through which water is lost (and light is absorbed). It also deprived cacti of a mechanism for coping with drought that is important for most desert-adapted plants: the ability to lose their leaves during drought. Most desert plants respond to brief dry periods by closing their stomata or by wilting and letting their leaves hang down such that they are not so exposed to sunlight. When conditions become severe, they can undergo a more drastic change and abscise their leaves, greatly minimizing water loss. 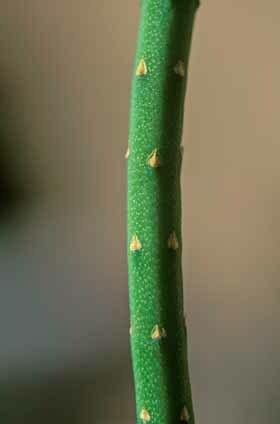 But cacti have no leaves to abscise during drought, their surface area is set. This inability to reduce total surface area during times of severe stress must be a significant problem for cacti. Of course, it can also be viewed as the inability to put out leaves and take advantage of mild conditions during a moist spring – either way, the permanent loss of leaves was a drastic alteration that seems less adaptive than having ephemeral, easily abscised leaves. This permanent loss of leaves in cacti is especially perplexing because many cacti actually do have all the genes necessary to make large, thin, flat photosynthetic leaves -- and each plant does use those genes to make big photosynthetic leaves, but only on the sides of the inferior ovary of flowers. It seems very strange that cacti never express these genes on their vegetative bodies. 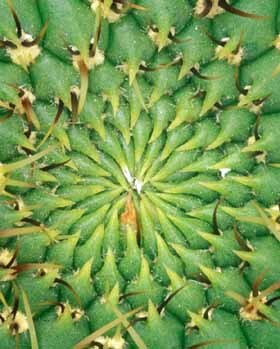 Go to the Flowers web page here for images of cactus leaves you might not have known about. Another consequence of leaf reduction in cacti was the loss of the xylem-unloading mechanism. Plants fill their xylem in the roots with the aid of the endodermis which, by active transport of mineral nutrients, can actually pressurize the stele and force water into the xylem. Water is unloaded from the xylem by being pulled by hydrogen-bonding out through the minor veins of leaves, petals and similar parts. The point is that almost all water is unloaded through the primary xylem of very slender minor veins in ephemeral organs – an extensive network of minor bundles which taken as a whole, has an enormous contact surface area with leaf mesophyll. When natural selection eliminated cactus leaves, it also eliminated the huge unloading surface area of leaf venation. Modern cacti with cortical bundles (subfamily Cactoideae) can still unload water through the primary xylem of those bundles, but the surface area of the cortical bundle network must be much smaller than that present in a leafy tree. 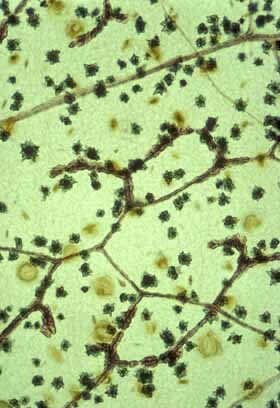 And the opuntioids lack cortical bundles so their water must be unloaded from secondary xylem – wood. But wood is adapted for the long-distance transport of water of course, not for unloading it. In most wood, vessels are surrounded by xylary fibers which would hinder water unloading. The loss of leaves must have thus greatly altered selection pressures involved in wood evolution, putting value on an increase in wood parenchyma which could help transfer water from wood to cortex. Mauseth, J. D., and R. Kiesling. 1997. Cacti and steak – this must be Argentina (Part 1). The Cactus and Succulent Journal (USA) 69: 279 – 286. Mauseth, J. D., and R. Kiesling. 1998. Cacti and steak – this must be Argentina (Part 2). The Cactus and Succulent Journal (USA) 70: 32 – 39.